» Press from the Watts Towers Ride of January 2012 Ride South L.A.
LA.StreetsBlog (February 7, 2012): A Ride to the Watts Towers: More than a Ride to the Watts Towers. 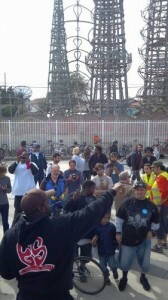 La.StreetsBlog (April 13, 2012): Start Your CicLAvia in South Los Angeles! Let us know if you Soon! hear of more!